When I unlocked a moustache and created Ron Swanson Pizza Bagel (Ron to his friends), I fell a little bit in love with Pizza Vs. Skeletons [$2.99 / Lite]. 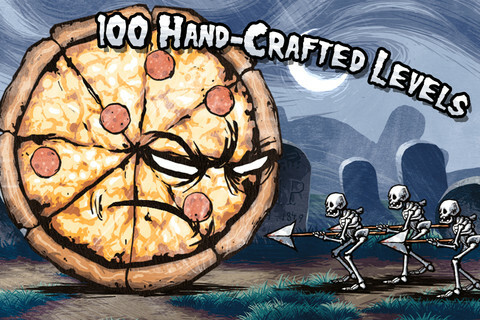 I mean, how many games let you play – and customize – a 10 foot tall pizza that’s out to crush every skeleton it finds? And it’s not all skeleton crushing, oh no. We’ve also got Pizza Rescues Trapped Puppies, Pizza Balances on Rolling Skulls and a hefty handful of other games in here, taking full advantage of everything a giant pizza can do. The common thread is the pizza (or tire, or moon, or…), and its three capabilities: rolling, jumping, and pounding the ground. You roll by tilting your device, jump by tapping the screen once and hit the deck by tapping again. Any of those moves can crush skeletons, which simply can’t stand up to the weight of a giant pizza. If you’re worried about the tilt controls, give the free version a try. I can tell you they’re better than most, easily calibrated, and fit perfectly with the gameplay, but try for yourself to be sure. Now obviously this game gets a little crazy, right? At first it seems that all you do is roll back and forth, crushing waves of skeletons and avoiding their spears by jumping sometimes. Of course that’s not all; that wouldn’t be nearly strange enough. There are traditional platforming sections where you roll your pizza to ski or rescue puppies (you crush their cages, see, and then they stick to your cheesy surface while you take them to safety). Among other oddities, we also get into castle crushing levels, levels where you bounce of brains for maximum board-breaking impact, and my personal favorite, a Feeding Frenzyesque survival-of-the-fittest sim that takes place under the sea. It could come off as too wacky, but I played most of the game with a stupid grin on my face. There is one thing I really don’t dig about Pizza Vs. Skeletons. There are 100 levels, which is rad, but that means you’ll be playing each game type quite a few times. They don’t all hold up to this repetition. With pizza-skiing, for instance, you have to deal with tiny platforms and explosions and things as you get to higher levels, but all of them pretty much look and feel the same. They just get longer, and longer, and eventually stop being all that novel. But you’ve gotta remember that you’re doing these things as a giant pizza, and that your fellow skiiers are skeletons wearing Santa hats. That absurdity goes a long way. That time when I was on the moon, knocking skeleton cherubs out of the sky? Still fun, even though I did something similar a few times already. If you like messing around with customization, Pizza Vs. Skeletons is a dream. 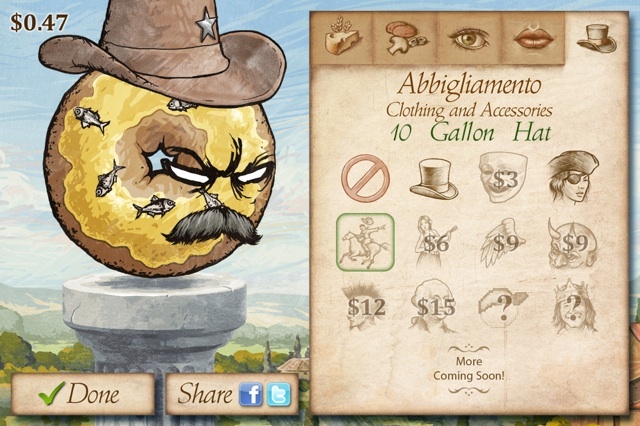 You pick up coins while you play, and you can use that money to unlock new bases, faces, hats and toppings. Not that into pizza? 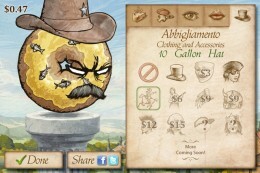 You can play a rolling jellyfish with a Stetson, gems for eyes and a beak. Why shouldn’t you, aside from the boundaries of good taste? Oh, and before you ask, no, you can’t buy extra currency with real cash. 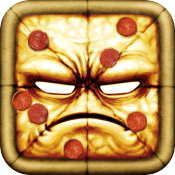 In this game, you’ve gotta earn your rewards, or at least win ’em on the Wheel of Pizza that pops up after every level. You’re free to earn your cash and play the game pretty much any way you want, skipping any levels that aren’t to your taste. You only need to earn 165 stars out of a possible 300 to open up all the levels across 10 chapters. It’s your usual three star, three goals system, but you can’t earn them individually. So if a level’s goals call for you to beat a timer, collect a certain number of coins and not get hit, you’ve gotta do that all in one go. But if you don’t want to grind, settle for two—it’ll still get you comfortably to the end. In other words, don’t let boredom get to you. It’s possible to grind the fun right out of this game, but if you stick to playing modes you enjoy and challenge yourself with three stars when you want to, there’s no reason this skeleton-crushing simulator should lose its charm. For a little extra spice, try finding (and wearing) the ten secret ingredients. They’re hidden in ten unnamed levels, but you might be able to join forces in our forums to hunt them down. If you’re on iOS 5, and you can live with music that can’t be disabled (it’s good music, at least), give this one your time. Riverman Media has infused Pizza Vs. Skeletons with a ton of humor, and it goes well with a side of creepy-cool art. Whether you’re sumo-fighting for supremacy or squashing skeletal spikies, it’s going to look good and feel great. It sounds like the developer has lots of plans for the future, so we’ll be looking forward to plenty more things to crush and new ways to crush them.